The full version of Eleanor Smith MP’s NHS Bill has now been published ahead of its scheduled second reading in the House of Commons on 26th October 2018. It is going forward with the support of the Labour leadership. and this further version provided on 14th September 2018 to Eleanor by Allyson and Peter after discussions with Lachlan Stuart in the Leader of the Opposition’s Office. More details of the development of the Bill, and the two differences between the first and the further version of the Bills provided to Eleanor, are set out in this statement from Allyson and Peter. The national consultation, promised by NHS England after the JR4NHS judicial review, is currently underway. It ends on 26th October 2018. NHSE has now dropped the term ‘accountable care organisation’, preferring instead ‘integrated care provider’ (ICP). But don’t be fooled by a change of wrapper. The judicial review succeeded in forcing NHSE to retreat from its original radical intentions but major problems remain with what’s proposed. NHSE is still pressing ahead without new primary legislation, and without ICPs having to be public NHS bodies. The claimants in the judicial review have now sent in their response to the consultation. There are major problems in safeguarding public accountability (33-39) and the role of clinical commissioning groups (24-28) in the new arrangements. The threat of creeping privatisation and charging remains, in spite of protestations to the contrary. (19 ,58-62). Responses to the consultation can be posted to The ICP Consultation Team, Area 2D NHS England, Skipton House, 80 London Road, London SE1 6LH, or via NHSE’s website. 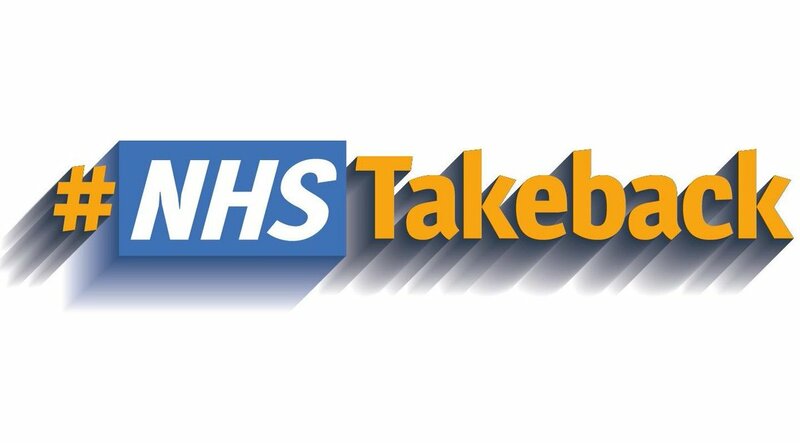 Professor Allyson Pollock and Peter Roderick have been discussing the re-tabling of the NHS Reinstatement Bill in the House of Commons on 11th July 2018 with Eleanor Smith, MP for Wolverhampton South West. We are delighted that an MP with Eleanor’s experience and commitment wants to do this. You can find here the proposed Bill that we have sent to Eleanor, which contains a number of changes from the previous Bill as presented by Margaret Greenwood MP, and the Explanatory Notes that we have prepared are here. A brief overview of the proposed Bill is below. In short, the Bill proposes to fully restore the NHS in England by 2021 as an accountable public service by reversing nearly 30 years of marketization, by abolishing the purchaser-provider split, ending contracting and re-establishing public bodies which plan and provide integrated services and accountable to local communities. The Bill gives flexibility in how it would be implemented, led by current bodies, including local authorities. abolish the legal provisions passed in 2014 requiring certain immigrants to pay for NHS services. “Thanks to the fantastic, far-reaching and committed campaign involving thousands of people, and our brilliant legal team, the government and NHS England have now accepted that there must be a national public consultation on ACOs, and that no ACO contract will be signed until that’s happened. This is great news, and a clear concession in response to our seeking a judicial review. NHS England’s lawyers promised this to our lawyers on Monday evening, and Jeremy Hunt confirmed this at the Health Select Committee yesterday. But don’t be fooled into thinking they’ve given up. Despite repeated questioning from Sarah Wollaston MP, the Committee chair, Hunt refused to delay the ACO regulations that he’s still planning for February, which are intended to facilitate the ACO contract – even though there’s no longer an urgent need for them – and he has still not accepted the need for an Act of Parliament before ACOs can operate lawfully. This is very important because the government has said they will change the definition of ACOs with input from NHS England, but we have absolutely no idea what the new definition will be. We still remain very concerned about the lack of transparency and the need for primary legislation on ACOs, and so we have told the court this afternoon that we want to press ahead with these points. Private companies lack transparency and accountability, the opposite of what we want for our public NHS. This is why we want to make absolutely sure of the definition of “Accountable Care Organisations” in any consultation. We think there is no point in a consultation if the ACOs they consult on are unlawful. We have been told by the court that we can expect a decision on permission tomorrow, or very early next week. Thanks once again for all your incredible support. 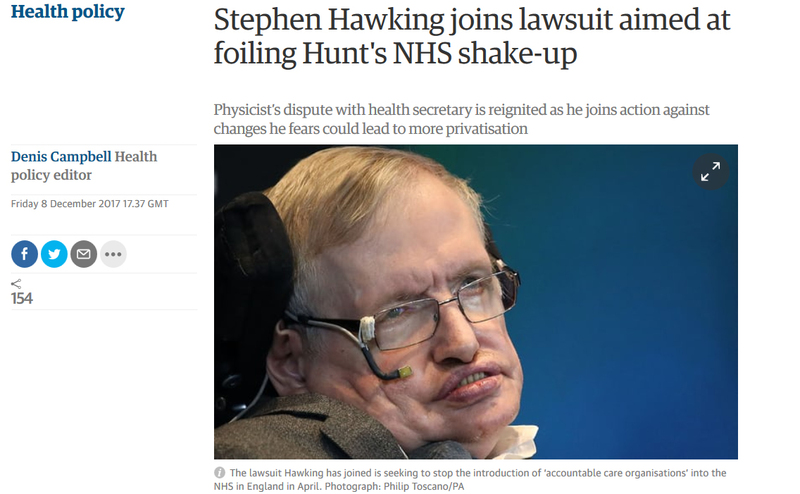 Stephen Hawking has joined the lawsuit seeking to stop the introduction of the first accountable care organisations (ACOs) into the NHS in England in April without proper public consultation and without full Parliamentary scrutiny. Read the full Guardian article from Friday 8th December 2017. If possible, please do support the crowdjustice funding appeal for the judicial review. The Judicial Review is against the Secretary of State for Health Jeremy Hunt and NHS England to stop them introducing new commercial, non-NHS bodies to run health and social services without proper public consultation and without full Parliamentary scrutiny – ACOs. ACOs would be governed by company and contract law and can be given “full responsibility” for NHS and adult social services. They were conceived in the US about 12 years ago, and are now being imported into England although they are not recognised in any Act of Parliament. They would be able to decide on the boundary of what care is free and what has to be paid for. They will be paid more if they save money. They can include private companies (e.g. Virgin in Frimley, Circle in Nottinghamshire), including private insurance and property companies, which will make money from charging. They could also include GP practices, in which case people on their lists will automatically transfer to the ACO in order to be entitled to services – new patients will also have to register with the ACO. They will be allowed to sub-contract all “their” services. Such commercial ACOs would fundamentally change the NHS and could profit from a radical reorganisation of health and social services. They would have control over the allocation of NHS and taxpayers’ money. Their accountability for spending it and their obligations to the public would be under commercial contracts, not statutes. It is also against the public interest that they are being introduced by stealth, without proper public consultation and without full Parliamentary scrutiny. Integration of health and care services is a desirable aim, but not whilst their funding and population bases are so different and without new primary legislation. This affects everyone in England. The Secretary of State for Health has carried out a consultation on technical changes to regulations in order to facilitate ACOs. But he did this without providing meaningful information about ACOs themselves and without consulting the public or Parliament about what his plans entail. The technical changes include suspending GP contracts so that GPs – and their patients – can transfer to the ACO. They also provide, for the first time, a definition of an “ACO” which confirms that they could be private companies. The correspondence makes clear that the Secretary of State and NHS England intend that the first ACOs should come into being as soon as the regulations are passed and before there has been public consultation. The claimants say that the Secretary of State and NHS England are obliged to consult and that ACOs lie outside the framework of the current legislation. The claimants also say that the decision to introduce them in this way is contrary to their duty of transparency in decision making in the NHS. The lawyers have studied the replies received to the first letter before action and have sent a further letter to both the Secretary of State and NHS England. The claimants intend to file proceedings in the court shortly, in time to stop the introduction of any ACO. Professor Allyson Pollock and Peter Roderick, co-authors of the NHS Bill, have written an opinion piece in the BMJ ‘Beware of US style Health Bodies – Jeremy Hunt must consult properly on Accountable Care Organisations‘. Professor Allyson Pollock, co-author of the NHS Reinstatement Bill, and three other eminent health professionals, Dr Colin Hutchinson, Professor Sue Richards and Dr Graham Winyard have begun a legal action against Jeremy Hunt, Secretary of State for Health. They are arguing that introducing new commercial, non-NHS bodies to run health and social services – Accountable Care Organisations (ACOs) – without proper public consultation and without full Parliamentary scrutiny would be unlawful. ACOs are one of the main mechanisms for implementing the policies Professor Stephen Hawking criticised last August. This is a critical time in the move to privatisation and Americanisation of the NHS in England. It’s going to be a big fight to stop it, we need a lot of money and we need everybody who can to help. Please consider donating towards the cost of the judicial review – and give the case and the funding appeal as much publicity as you can think of amongst your family and friends and wider afield. Moved by Alex Scott-Samuel of the Socialist Health Association and seconded by Sue Richards of Islington CLP – both members of Keep Our NHS Public, the motion received strong support and was carried. It names accountable care systems and accountable care organisations as a dangerous move towards enforced capping of damaging cut budgets, which would lead to restricted access to a diminished range of services – the inevitable result of the imposed, disastrous £22bn of underfunding of the annual NHS budget by 2020/21. The motions goes further. It opposes the sell-off of £5bn of NHS estate planned under the Naylor Review adopted by the Conservatives. Under the terms of this motion, the 2012 Health & Social Care Act would be replaced by legislation restoring a universal and comprehensive fully publicly funded, owned and provided NHS restoring full duties to the Secretary of State. This reaffirmed the position the 2016 conference voted for, but which had not been adopted by the Shadow team. On Sunday 17 September, Jeremy Corbyn stated his commitment on the Andrew Marr Show that the Labour Party would adopt conference-agreed policy direction. If this practice is realised, then we could be on the cusp of a dramatic strengthening of commitment from Labour – confident as they are in predicting they will be the next government – to restoring the NHS to its former vision. The policy as agreed would end the era of privatisation, and of internal or external markets, would end use of new PFI contracts and bring back into the NHS’ the current PFIs used to extract profits from NHS core funding and undermining the stablility of so many NHS hospitals and trusts and deliberate defunding of the NHS. There is also the commitment to reinstating NHS student bursaries and an end to the pay cap impoverishing and demoralising the 1.3 million NHS staff. The end to the ideological defunding of the NHS will require greater level of funding than is currently being recognised. Great work was done in achieving the adoption of this motion by NHS campaigners in the Labour Party. And related work helping to strengthen the mood for change included the #NHSTakeback pledge and Allyson Pollock’s paper in OurNHS on Labour’s manifesto – those involved include We Own It, the Campaign for NHS Reinstatement Bill, Keep Our NHS Public, Health Campaigns Together, OurNHS, Socialist Health Association, NHS Support Federation, Doctors for the NHS, Momentum, 999 and others. Parliamentary debate and due legislative process. On 9 August, the House of Commons Library revealed a doubling of the number of NHS sites being sold off. 117 of these currently provide clinical services. Like their US templates, ACSs will provide limited services on restricted budgets, replacing NHS hospitals with deskilled community units. This will worsen health indicators like the long term increase in life expectancy, stalled since 2010. The ACSs and asset sell-off result directly from the 5 Year Forward View (5YFV) currently being implemented via Sustainability and Transformation Partnerships (STPs). The 5YFV precisely reflects healthcare multinationals’ global policy aims. New legal opinion finds STPs lack any legal powers or status under the 2012 Act: yet they seek through bureaucratic means to eliminate or override the already minimal remaining level of local accountability and democratic control over NHS commissioning and provision. They could eliminate remaining statutory powers and rights of local authorities, commissioners and providers. Many of these also outline plans to establish ‘Accountable Care Systems’. reversing All privatisation and permanently halting STPs and ACSs. cementing the private sector role as ACS partners and as combined health/social care service providers. Party policy to restore our fully-funded, comprehensive, universal, publicly-provided and owned NHS without user charges, as per the NHS Bill (2016-17). Labour created our NHS. Labour must now defend it. Co-authors of the NHS Reinstatement Bill, Allyson Pollock and Peter Roderick, alongside Shailen Sutaria – a specialty registrar in public health medicine – have published an analysis piece in the BMJ titled ‘Are radical changes to health and social care paving the way for fewer services and new user charges?’. STPs, accountable care organisations, devolution deals, joint commissioning of health and social care services, and redesign of the local government finance system are radically changing the NHS and local government in England. The effect on service provision of the fundamentally different funding bases for health (free at the point of delivery) and social care (means tested) services has been ignored. The changes are likely to lead to reduced services and entitlements, more private provision of publicly funded services, and potentially more user charges. People in poorer areas are likely to lose out as funding will depend more on the wealth of local areas and less on the principles of redistribution and need. The evidence for and effects of these changes on access to care, equity, and widening inequalities must be disclosed and understood.